Schloss Neugebäude was once the most elaborate 16th century palace of Vienna, a late-Renaissance piece of architecture (Manierist) that ranked among the finest European palaces of its time. Nevertheless, Schloss Neugebäude is unknown to many Viennese today. I had lived in Vienna for half a year when I first noticed it: On a 16th century painting (the one displayed above) in the Wien Museum. The palace (or what is left of it) can be found in the south of Simmering, on the outskirts of Vienna. It is not far from the Zentralfriedhof and mostly incorporated into the city′s crematory. But let′s start with the beginning of the building′s history. During the first siege of Vienna in 1529, Sultan Suleyman′s tent and headquarter was at this very site in Simmering. A while after the defeat of the Ottoman armies, the Habsburg Emperor Maximilian II decided to build himself a fancy palace at this place in 1568 to commemorate the victory of Vienna and the Holy Roman Empire. By that time, the Emperor already had a palace in this area, the hunting chateaux of Kaiserebersdorf. Thus the name of the new palace: "Neugebäude" means "new building". From the beginning, Schloss Neugebäude was meant to be a leisure palace ("Lustschloss") with extensive gardens, follies and a menagerie in the style of an Italian "villa suburbana". A countryside retreat off the busy city of Vienna. Maximilian II invested a little fortune into the construction of the palace, making it what many people thought was the finest Renaissance palace outside of Italy. The gardens were filled with exotic plants that also served a profane purpose: Fruits that were harvested from the exotic trees were presented at dinners at the Imperial Court in Vienna. In 1576, Maximilian II suddenly died in Regensburg. Schloss Neugebäude was an enormous construction site and not completed. Maximilian′s son and successor to the throne, Rudolf II, showed little interest in the building. He did continue the construction work, but at a very low rate. Rudolf II preferred his court in Prague and spent almost his entire life as an Emperor there. The main building of Neugebäude was completed in 1587, the wall around the outer garden followed only a bit later. 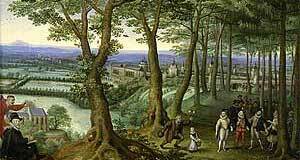 Rudolf′s brother Matthias liked the gardens of the palace and despite of the interiors being still a construction site, he used the garden for representation and celebrations. In 1607, the small menagerie of Schloss Kaiserebersdorf was transferred to Schloss Neugebäude. It was the first of its kind with exotic animals north of the Alps. During the following decades, several damages had to be fixed and the interiors were arranged and re-arranged a few times. In the course of the Second Siege of Vienna in 1683, the Turks returned to the site - using Schloss Neugebäude as a supply base. This spared the palace the fate of being looted. Only a few years later, in 1704, the Kuruzzen-revolt under the rule of Prince Franz II Rakocky brought enemy troops back to the palace - and these ones did loot the palace and killed almost all animals in the menagerie. After this had happened, the palace was re-furbished, once again half-heartedly. Only the menagerie even gained significance: It had been re-built under the rule of Emperor Karl VI, and when Prince Eugene of Savoy died with no heir (suprise, he was gay), his extensive menagerie from Schloss Belvedere Palace was transferred to Simmering. Empress Maria Theresia didn′t appreciate Schloss Neugebäude very much. She preferred Schönbrunn and spent a lot of dedication and financial attention to its extension. In 1752, she and her husband Emperor Karl of Lorraine founded a new menagerie in Schönbrunn - the base of today′s zoo, considered by some (but not me) to be the oldest zoo in the world. The menagerie of Schloss Neugebäude was then dissolved and most animals taken to the new one. Continue with "Schloss Neugebäude, Part II"